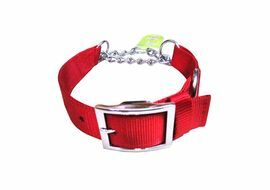 Canine Nylon Padded Collar Set features a double layer construction which makes it funky, durable and long-wearing. The bright colour scheme keeps your pet up to date in the fashion arena. 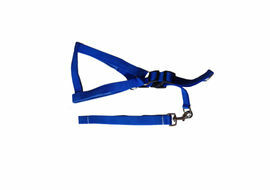 The collar set comes with fine padding of neoprene which makes it comfortable for dogs to wear. Build to last for a long time. Pick one today. To determine proper size, measure the circumference of pet's neck and add 1"-2"
Note: The colour tone / shade might slightly vary in the actual product. Canine Nylon Padded Collar Set features a double layer construction which makes it funky, durable and long-wearing. The bright colour scheme keeps your pet up to date in the fashion arena. 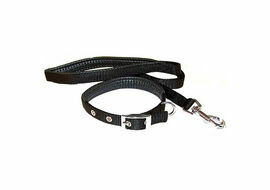 The collar set comes with fine padding of neoprene which makes it comfortable for dogs to wear. Build to last for a long time. Pick one today. 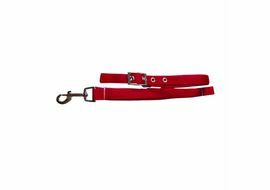 Features:Matching leash has padding on inside of handle for better comfort and controlCollar has nickel plated buckle and grommetsDouble stitching for added strengthTo determine proper size, measure the circumference of pet's neck and add 1"-2" Size Collar Leash Small 10”-13” x 0.5” wide 46” long x 0.5” wide Medium 13”-17” x 3/4” wide 46" long x 3/4" wide Large 15”-19” x 1” wide 46" long x 1" wide Note: The colour tone / shade might slightly vary in the actual product.